​Profound, intelligent and transformative, Iyengar Yoga is a complete approach to life that provides practical tools to create and maintain bodily health and vitality, mental clarity, emotional serenity, and spiritual well-being. Developed by yoga master B.K.S Iyengar during his more than 75 years of teaching, Iyengar Yoga is grounded in the ancient Indian tradition and philosophy of Patanjali’s Yoga Sutras. Our classes are taught by rigorously-trained, dedicated teachers who focus on strength and stamina, flexibility and balance, concentration and meditation. We offer a full slate of daily classes, workshops, special series, guest teacher and community events, and teacher training and continuing education for teachers. Yogacharya B.K.S.Iyengar (1918-2014) was a living legend who taught yoga in unique way to all his students. He found the meaning of the yoga sutras by his practical search and regular practice of yoga. ​Thus, he helped all to experience the wisdom of the yoga sutras. 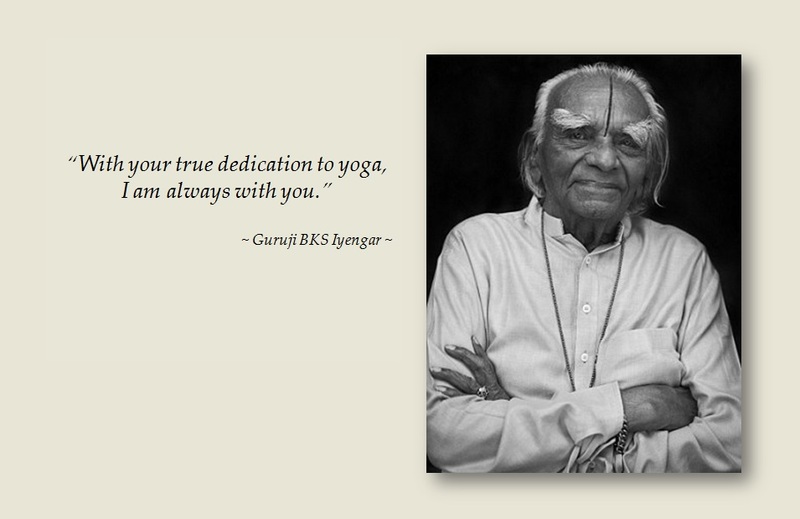 His style of teaching yoga is called "Iyengar Yoga" and is now being followed by certified teachers across the world. ﻿A safe and systematic progression of study to develop each student’s skills and abilities, within each class and from class to class. Certified teachers, highly-qualified and rigorously-trained, with a deep commitment to excellence in teaching. A highly-developed teaching methodology including clear demonstration of the postures, precise use of language and specific instructions to develop students’ understanding and intelligent action in practice. Sequencing of the postures that helps students develop strength and flexibility, stamina and concentration, and correct body alignment. Individual correction and adjustment of students, when necessary. The use of props such as blankets, blocks, belts and chairs to deepen learning and adjust postures to individual needs.